My name is Scott Chaplowe and I currently work as the Director of Evidence, Measurement and Evaluation for climate at the Children’s Investment Fund Foundation (CIFF). As an evaluation professional, much of my work is not simply doing evaluation, but building the capacity of others to practice, manage, support and/or use evaluation. I’ve discovered I am not alone as other evaluation colleagues have echoed similar experiences with evaluation capacity development (ECB). Adopt a systemic (systems) approach to organizational evaluation capacity building (ECB). 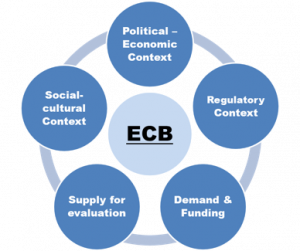 ECB does not happen in isolation, but is embedded in complex social systems. Each organization will be distinct in time and place, and ECB interventions should be tailored according to the unique configuration of different factors and actors that shape the supply and demand for ECB. Supply refers to the presence of evaluation capacity, (human and material), and demand refers to the incentives and motivations for evaluation use. The conceptual diagram below illustrates key considerations in an organizational ECB system. Meaningfully engage stakeholders in the ECB process ECB will be more effective when it is done with rather than to organizational stakeholders. Meaningful engagement helps build ownership to sustain ECB implementation and use. It is especially important to identify and capitalize on ECB champions, and mitigate ECB adversaries who can block ECB and its uptake. Systematically approach organizational ECB, but remain flexible and adaptable to changing needs. ECB is intentional, and therefore it’s best orderly planned to gather information and analyze demand, needs and resources, identify objectives, and design a realistic strategy to achieve (and evaluate) ECB objectives. However, a systematic approach does not mean a rigid blueprint that is blindly followed, which can inhibit experimentation to respond to changing capacity needs. ECB should remain flexible to adapt to the dynamic nature of the ECB system, which will vary and change over time and place. Align and pursue ECB with other organizational objectives. ECB should not be “silo-ed,” but ideally planned with careful attention to other organizational objectives and capacity building interventions. Consider how ECB activities complement, duplicate or compete with other capacity building activities. Rad Resources – Read more about this top 10 list here and you can view the AEA365 presentation. Also, check out the book, Monitoring and evaluation Training: A Systematic Approach, and this webpage has an assortment of resources to support evaluation learning and capacity building. Hello. I ‘d like to know more about Step 2 when you suggest follow-up with attention to transfer. In terms of learning and behavioural changes that should take place, what timelines do you suggest follow-up take? Also, what is the scope of an evaluator for transfer and evaluation use and for how long? What do you suggest in the case of symbollic/legitimative evaluation?